This summer at Pierce we will be unveiling a new optional tutoring program for our campers in the 6’s age group and up! We have partnered with one of the most respected tutoring services in our Long Island and Manhattan communities, Private Prep. Private Prep was founded by Pierce Camp Birchmont alumnus, Steve Feldman, and the Long Island office is run by Pierce Country Day Camp parent and Private Prep partner, Jeremy Cohen. In partnership with Pierce, Private Prep is developing a tutoring program specifically for our camp community focused on one-on-one tutoring for our campers who have completed Kindergarten through 7th grade. Families can sign their camper up for half hour or one-hour time slots for one-on-one time with a Private Prep tutor up to three times per week. In order to provide a personalized experience, Private Prep’s dedicated tutors will start the process with a preliminary meeting with your family before camp to discuss your tutoring needs and goals. In addition, throughout the process parents will have direct communication with their child’s tutor and receive on-going updates and progress reports as needed. These private sessions cost $125/hour and payment will be handled directly by Private Prep. All lessons will take place on site in our air-conditioned Mansion building to allow our campers to focus and get the most out of their tutoring time. For those families who have expressed interest in an option like this over the past few summers, we hope you will take advantage of this exciting new program at Pierce! We are thrilled to be featured in this NY Family article featuring Director Will Pierce. One of the features that makes the camp experience so special are the traditions and rituals that take place each summer. Camp traditions deepen the connection to the camp community and they become ingrained in the camp culture. They help to tie together the generations of campers and staff that came before and will come after. Traditions give campers events to look forward to summer after summer. For 40 years, the boys camp at Camp Scatico has done a rope burn during color war and it’s something that graduating campers aspire to take part in years in advance. “The entire camp collects wood during the day for the evening rope burn and graduating campers strategize on what type of fire to build, how much kindling to use and what kind of wood would work best to burn the rope hanging between the poles. For graduating campers, building a fire in front of the whole camp is very memorable,” explains David Fleischner, a third-generation Owner and Director of Camp Scatico, a brother-sister overnight camp in Elizaville, NY. At Pierce Country Day Camp, two of the oldest traditions are the director jumping through a hoop of fire and making magic rock candy. “Every child hopes they get chosen to make magic rock candy and that they are one day old enough to stay at camp late to see us jump through a hoop of fire into the pool,” Pierce says. Alumni appreciate the continuing traditions that occur each year and helps them feel connected to the camp, even long after they have attended themselves. Pierce says: “I love having parents and alumni tell me that my grandfather cracked an egg on their head to make magic rock candy. They can’t believe it’s still happening at Pierce so many years later. Sneak Peak – What’s New for 2019! At Pierce, we never stop working on camp. We have been hard at work reviewing last summer’s program and performance in all areas and are very excited about what we have in store for this upcoming summer season! Here is a sneak peek of just a few things we are adding to Summer 2019 to make it the best one yet! 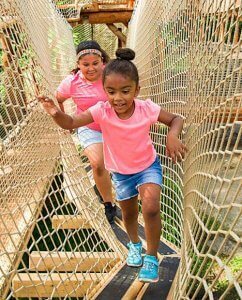 New Treetop Trail Aerial Ropes Course: We will be installing a brand new playground for our 5’s and up. 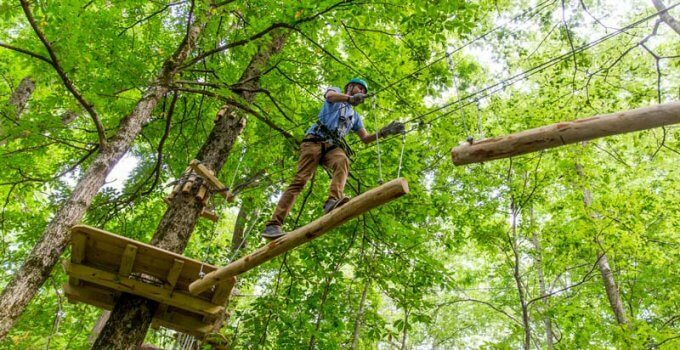 This aerial course has been designed by Tree-Mendous Aerial Advenutures (the team behind the new Bronx Zoo course) and will feature 11 harness trails, a ropes course, suspension bridges, jump tower, and a zipline. This course will blend in with the mature tree landscape here at Pierce. Located just across from our 5’s cabins, this tactile and shaded playground will be tons of fun for our campers. Junior Camp Cabin Renovation: We’ll be renovating many of our pre-school classrooms which serve as cabins for our 3’s, 4’s and 5’s in the summer. Expect to see some new bathrooms, colors, flooring and designs in many of our junior camp cabins this summer! New Vehicle Additions to Our Bus Fleet: As you know, Pierce is proud to be the only camp that owns and operates our own bus fleet. We buy new vehicles every year of course, but this year we made a major reinvestment into our fleet with brand new buses to better serve our growing camp…Beep Beep! At Pierce, we never rest on our laurels… Our commitment to excellence is unwavering and we strive for the best! Week 6 makes us HAPPY! Kindness counts and we really appreciate your support for our first #Strides4SCOPE initiative to help raise funds throughout this week for SCOPE! Our Swim-a-thon on Tuesday’s Camp Kindness Day supported SCOPE (Summer Camp Opportunities Promote Education) which provides children who otherwise could not afford the camp experience with the opportunity to go to camp! All Pierce campers participated in the swim-a-thon to help children from low-income families build new dreams and envision brighter futures. In addition to the swimming activities at the pool, our campers were included in discussions about the core values of kindness, compassion and generosity. It is no coincidence that this week’s 21st Century Skill at Pierce is “KINDNESS,” and reflects our continued commitment to promoting caring for others. It’s not too late to donate – and it’s easy! Simply click here to donate!